My mouth waters just by thinking of these Dulce de Leche Crepes. A simple and easy Argentinian dessert, made even quicker when you use my favorite shortcut! I can’t believe it took me that long to post this recipe, as it is one of my favorite desserts of all time. 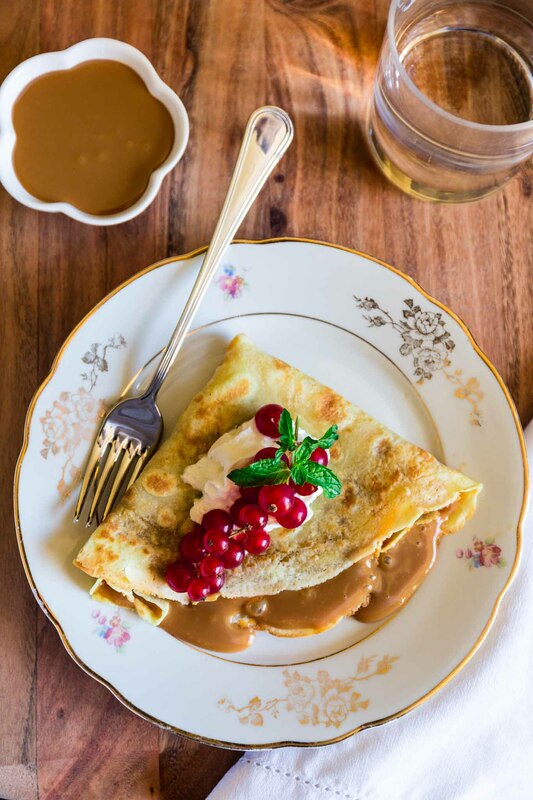 I have such sweet memories of eating the most amazing Dulce de Leche Crepes during our trips to Buenos Aires (or even Chile or Uruguay) and I was dying to recreate it. I guess I was postponing it because I didn’t want to go through the trouble of making my own dulce de leche and finding it in stores in the U.S. was nearly impossible. Until I found out that La Lechera had a dulce de leche line. You know that one friend we all have that gets very excited every time they release the new iPhone? Well, that is me with my newly found store bought dulce de leche! ??? I am happy with just a spoonful of this creamy Nectar from the Gods over a slice of cheese, but I am in heaven if you give me my favorite crepe! ? Since I am Brazilian, I’m very lucky to have been enjoying Dulce de Leche since I was a little girl. However, here in the US, it was just recently that it started getting traction. Nowadays it is so trendy that it even has its own day: October 11. Not that I need a World Dulce de Leche Day to enjoy this caramel-y confection. But it is nice to know that the world is finally giving it the attention it deserves! The crepes are light and delicate and they can be made in the blender. You are welcome to get your work out done by blending the batter with a whisk, but I am always happy to put my appliances to work! 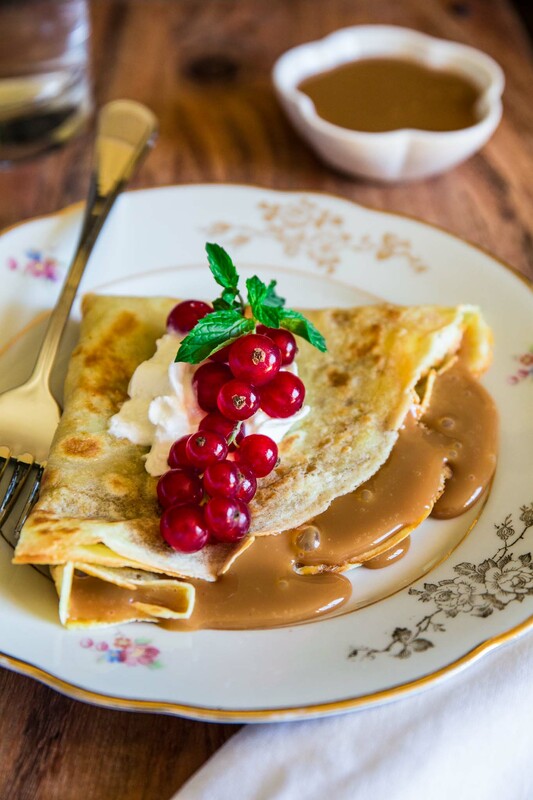 The recipe makes enough Dulce de Leche Crepes for 4, as you usually have to throw away the first crepe. However, if you have dulce de leche lovers (like me!) among your guests, I would definitely double the recipe, as this treat is such a crowd-pleaser that you’ll have people going for seconds! 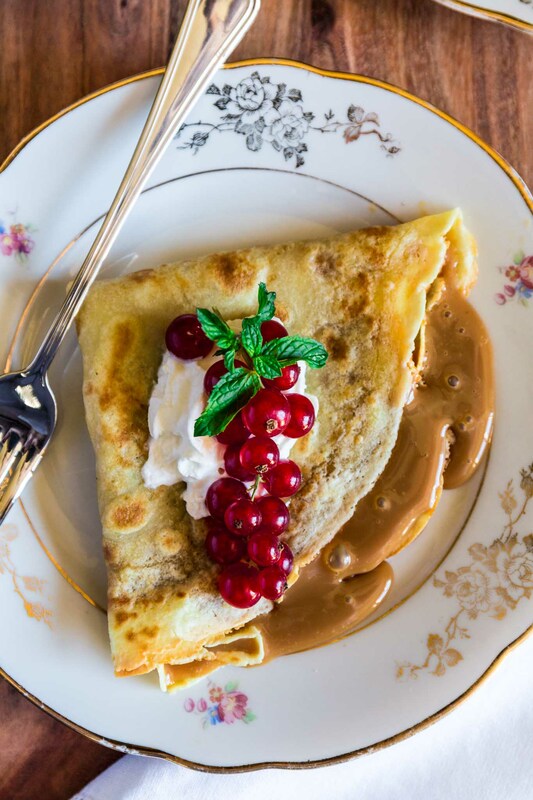 If you weren’t familiar with Dulce de Leche, I 100% guarantee that you will be obsessed after you try these crepes. And once that happens, head over to La Lechera’s Facebook Page so you can get some more inspiration on what else to make with dulce de leche. Combine all the ingredients, except the dulce de leche, in the jar of a blender and blend until smooth. You can also whisk everything together by hand. Cover the jar and let the batter sit for about 30 minutes or overnight in the fridge. Pre heat a 10-inch nonstick pan (or crepe pan) over medium heat. Spray with cooking spray or add a little vegetable oil and, once hot, add a ladle of batter. Immediately, pick up the pan and swirl to spread the batter into an even layer. Once the crepe has browned slightly on the bottom, carefully lift it using a spatula and flip. Cook the second side until golden and slide the crepe into a plate or cooling rack. Repeat with the remaining batter, adding more oil or cooking spray as needed. Place the crepes on your counter and spread the desired amount of dulce de leche down the center of each crepe. Fold each crepe twice and decorate with powdered sugar, whipped cream and/or fresh fruit, if desired.